Ian Rapoport of NFL Network reported that San Francisco 49ers linebacker Malcolm Smith is out for the season with a torn pectoral. Smith was signed as a free agent in March, and the injury should allow more playing time for rookie Reuben Foster. 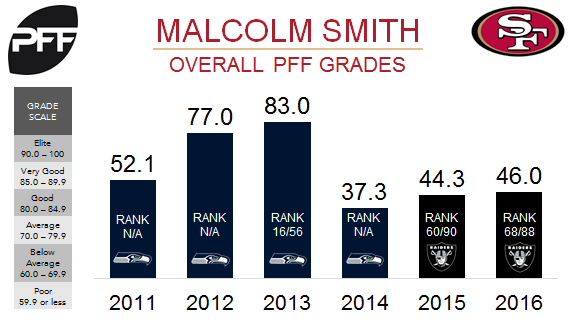 Smith’s best season was 2013 with the Seattle, when he played 631 snaps and his 83.0 overall PFF grade ranked 16th of 56 qualifying linebackers. After signing with Oakland in 2015 and becoming a three-down linebacker, Smith’s performance suffered and he posted a 46.3 grade in 2016, 68th of 88 linebackers. Smith struggled in coverage, allowing six touchdowns in 2016, the second-most of any linebacker. His 1.16 yards per cover snap last season ranked 38th out of 51 linebackers with at least 200 snaps in coverage.